Originals, prints and unique merchandise featuring my fine art and photography. Most of my fine art, even if the original is sold, is available as a print in various sizes and as note cards or greeting cards in various sizes. In addition, I create unique items by hand such as block-printed textiles, or I have printed mugs or tiles imprinted with an image. Right now you can't search for a particular item, but I do hope to 0ffer that soon. E-mail me if there's something you want to order and can't find or want to know more about and I'll get right back to you. Everything goes into the same big shopping cart whether you ordered it from my main site or the cart. You'll also find some duplication between the main site and this site in that the same things are sold in both places; this is for the convenience of customers who don't want to jump around. This will eventually change, but for now, sorry for the confusion! "Paths I Have Walked: the poetry and art of Bernadette E. Kazmarski"
People who've attended one or more of my last four poetry readings have encouraged me to publish some of my poetry in a book from the beginning. Once I completed my 2010 poetry reading, my fourth featuring the final piece of artwork in the "Art of the Watershed" series, I decided it was time to publish something and it should be those four poetry readings. Poetry books are not best-sellers; it's difficult to convince a publisher to risk effort on a beginning poet, and while self-publishing is the best option it's not inexpensive and once you've got the book, someone's got to market it. Plus, I'm a graphic designer and I designed books for years, and I want things my way. All of this is a recipe for a little bit of trouble, but I decided the book was well worth the effort so I designed the book myself and had a set printed—no ISBN or anything formal, but it's a start! I'm really excited to offer it. Books are 4.25" x 11", 40 pages of information and poetry, with glossy covers featuring "Dusk in the Woods" and little thumbnails of all four pieces in "Art of the Watershed". You can order one here, or visit me at Portraits of Animals at Carnegie Antiques, 423 West Main Street, Carnegie, 11 to 3 Wednesday through Friday and 10 to 4 Saturday; call before you stop, though. In December, 2006, two of my poems were chosen to be published on a section of the Prairie Home Companion website entitled “Stories From Home/First Person” for submissions of writing about the place we feel most familiar. I’m a long-time listener to PHC and reader of Garrison Keillor’s books as well as a daily listener to The Writer’s Almanac featuring news about writers and writing and of interest to writers as well as a poem, all compiled and read by Keillor himself. I was astonished to fi nd my poems were among the first chosen from apparently thousands, and so happy to be able to share them with a potential audience of so many similarly inclined writers and readers. that being the valley where the Lower Chartiers Creek flows. Clearance on Woven Cotton Blankets, "Dusk in the Woods" and "The Goddess"
These blankets have been pretty popular this fall, and I’m down to just a few left. I’m not sure an order to have more made could be done in time to ship for the holidays, so this is it! 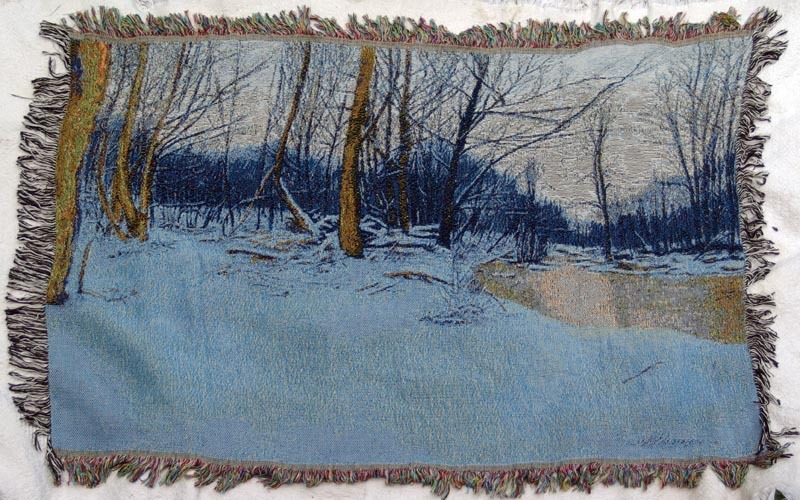 I found a company that converts my artwork to a tapestry-style weaving, not an imprint, and the blankets are made in the USA of 100% USA-grown cotton. All blankets are fringed with black and white fringe on the sides and multi-color fringe on the top and bottom. They are so soft and comfortable that I’ve been using some of my samples. These blankets are 36″ x 50″, large enough to cover you on the couch. They come with a zippered bag for storage.$25.00 each plus $10.00 shipping in the continental United States. 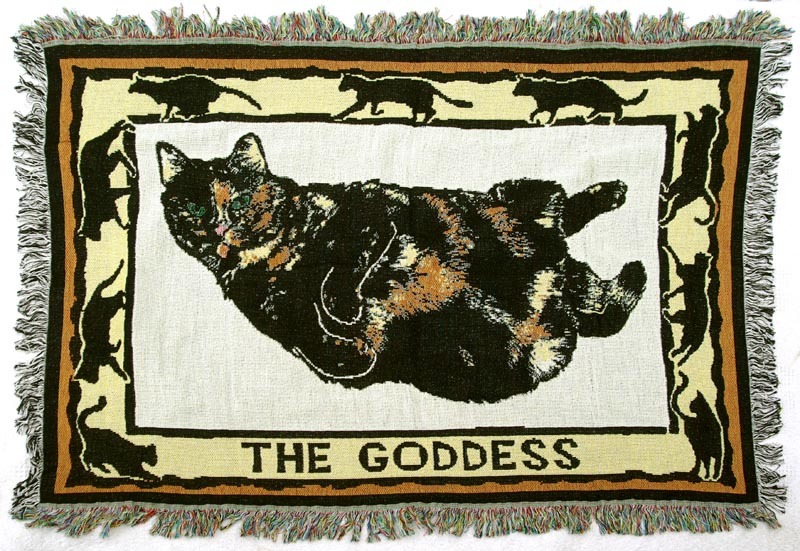 The Goddess: ONLY 1 LEFT! Please visit Portraits of Animals on Etsy to see what's currently available in unique and handmade items from customized block prints, framed photo prints, crocheted washcloths, printed tees and many other gift items. Copyright © 2010-2011 Bernadette E. Kazmarski. All Rights Reserved.